If you’ve been visiting my site for very long, you know that I am a big fan of chocolate and peanut butter. I am also pretty much in love with scones. It was only a matter of time before I combined the two into one spectacular recipe. And yes, these scones are spectacular! I was wishing I made a double batch, because my family devoured every crumb of these tasty scones! Scones are simple to make, just be sure you don’t overwork the dough. 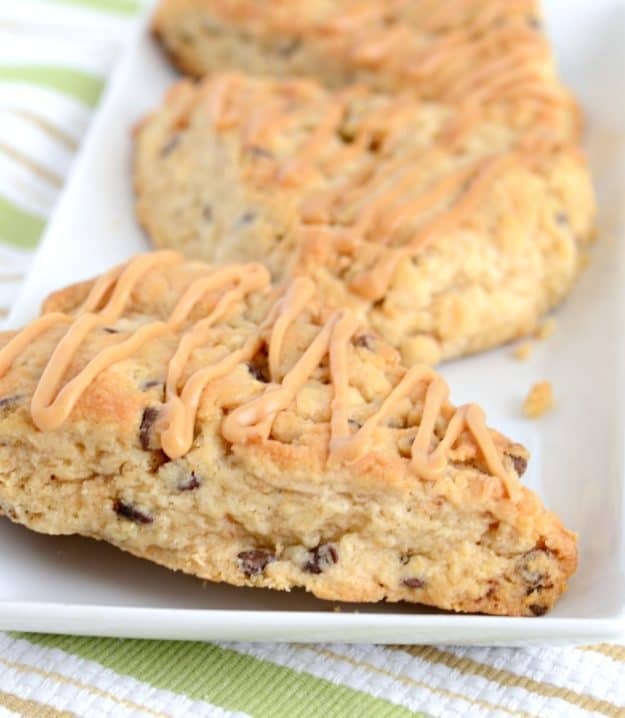 For these scones, you cut the peanut butter in with the butter. I use this pastry cutter, and it works like a charm. I used creamy peanut butter because that’s what I had on hand, but crunchy will work fine. The glaze won’t be as smooth (obviously), but you will have a yummy crunch. 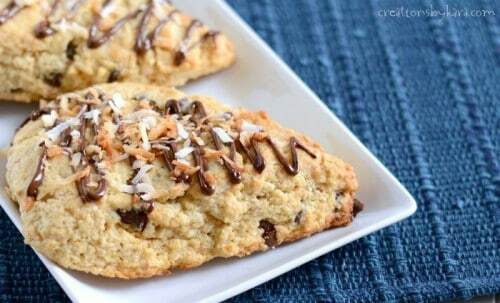 Mini chocolate chips work perfectly for this recipe. 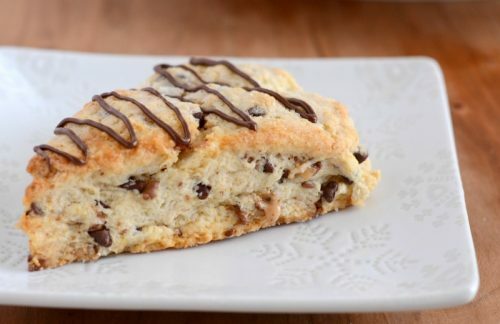 They spread evenly throughout the whole scone, making sure you get plenty of chocolate in every bite. And of course I’m all about having plenty of chocolate! 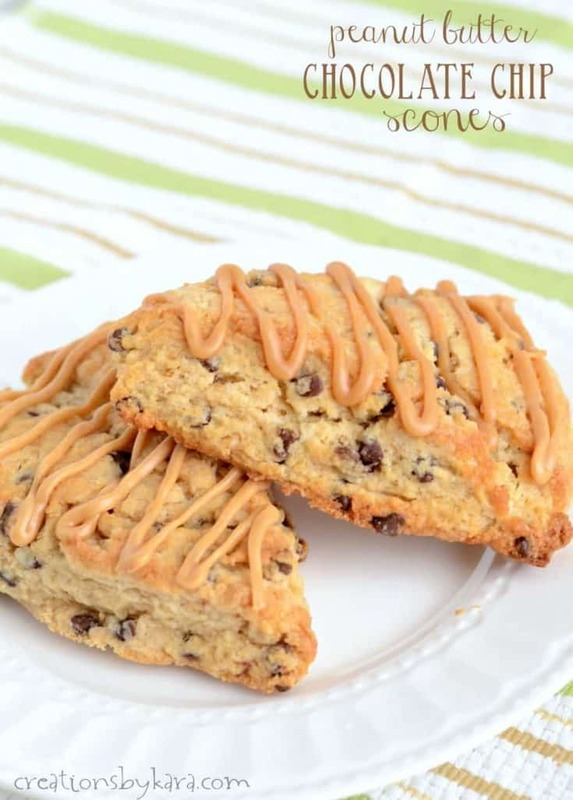 Every bite of these peanut butter scones is heavenly. I’m drooling just thinking about them! 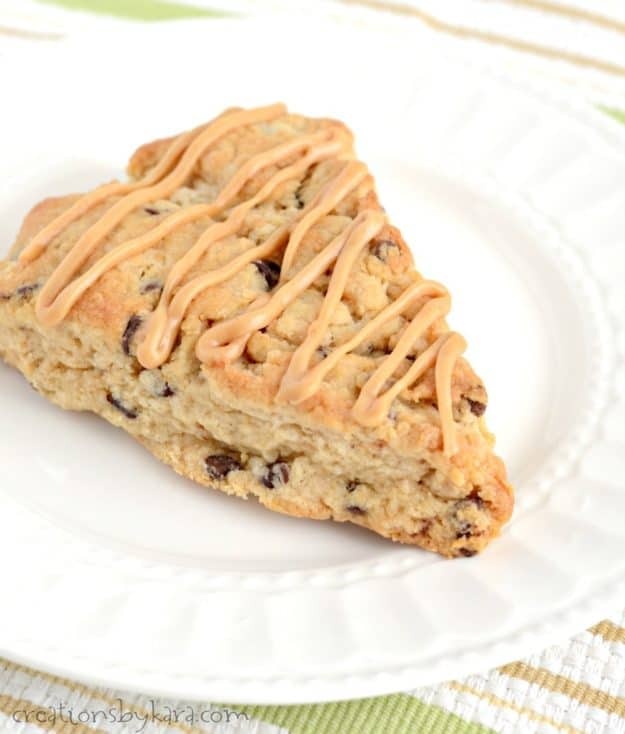 Decadent peanut butter scones with chocolate chips and a peanut butter glaze. Whisk together the flour, sugar, baking powder, and salt in a large mixing bowl. Cut in the butter and peanut butter. In a small bowl, whisk together the egg, sour cream, milk, and vanilla. Add to the dry ingredients with the chocolate chips and stir gently till barely combined. Pat the dough together in the bowl, then dump out onto a floured counter. Pat the dough into an 8" circle. Cut into 8 wedges, and place 1" apart on silpat lined or lightly greased cookie sheets. Bake at 400° for about 12 minutes or till golden brown. For glaze: Whisk together ingredients and add enough milk to make a thin icing. Place in a ziplock bag and snip the corner. Squeeze the glaze on top of the warm scones. Delicious! And so easy to make. I will never buy scones again! Thannks for the recipe! Peanut butter and chocolate make the BEST combination! 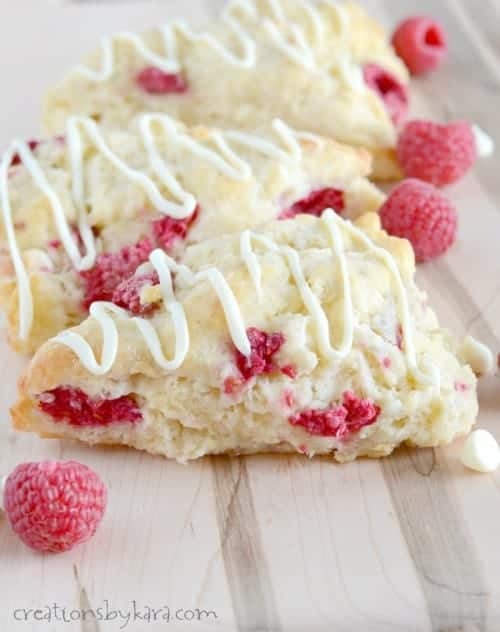 We love scones and this recipe was seriously amazing. The kids are addicted! 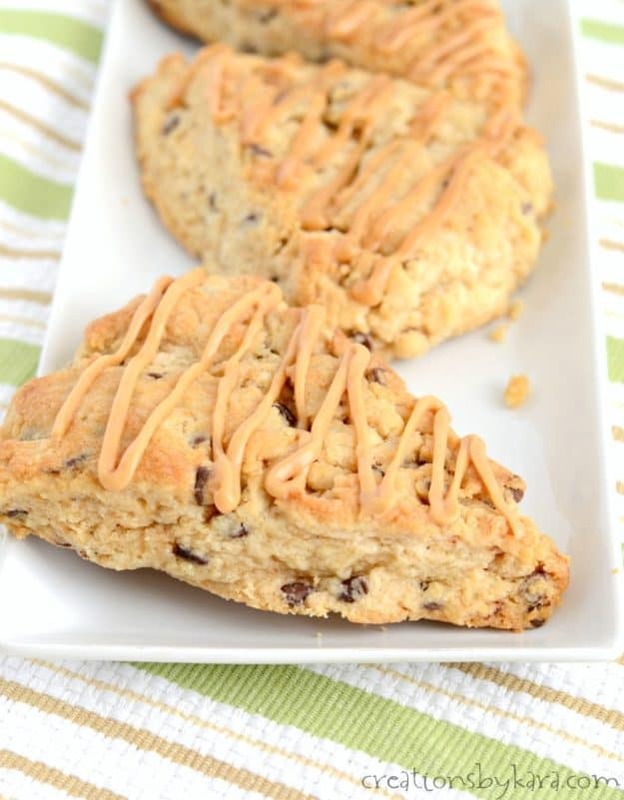 These scones are delicious and paired perfectly with my morning coffee this week! 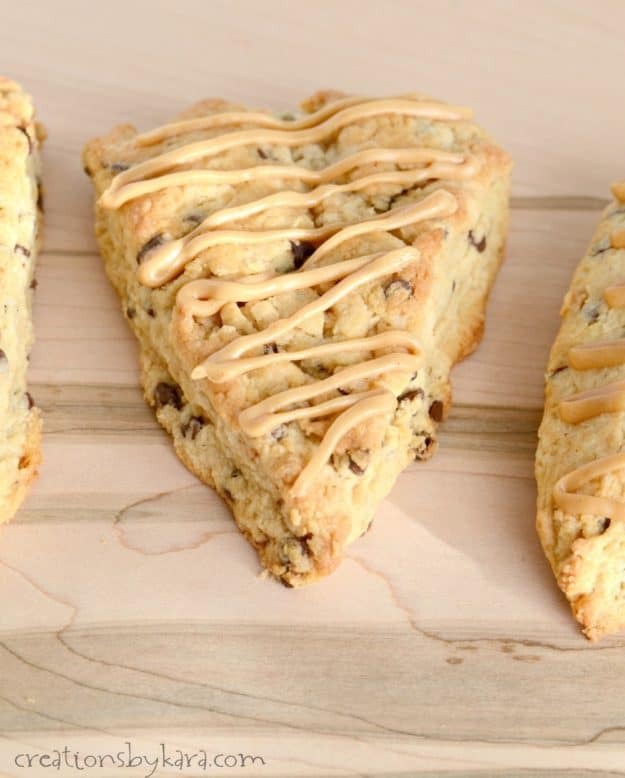 I love scones & I especially love the peanut butter & chocolate combination! Thanks for sharing this…my family will enjoy these! I have a cast iron scone pan can these be made in that? If so would the temperature and time be the same? I have never tried a cast iron scone pan, so I’m not sure. I’d say you could keep the temperature the same, but watch them closely in case they bake faster. They may need less baking time. Or they may need more. Give it a try and let me know! 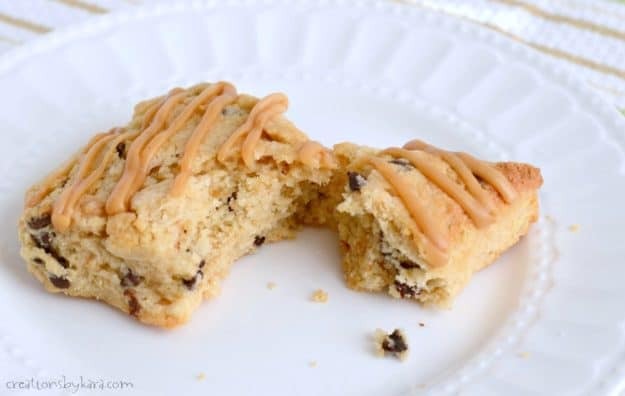 Chocolate Chip Peanut Butter Scones are the BEST SCONE RECIPE I have ever made! I switched only one thing: I used Nutella in the Glaze instead of Peanut butter. Thank you for this recipe – It is a repeat recipe in my home and everyone wants a copy of it. I bet they were super tasty with the Nutella – thanks for the tip! Made them using whole wheat white flour and creamy pb (the kind without sugar). Great recipe they turned out great. I didn’t do the regular circle with the triangles but did a big rectangle and then refrigerated it then cut it into 12 squares. I always throw scones into the fridge or freezer briefly before making to make sure the butter doesn’t get too warmed up. Perfect. They are all gone. 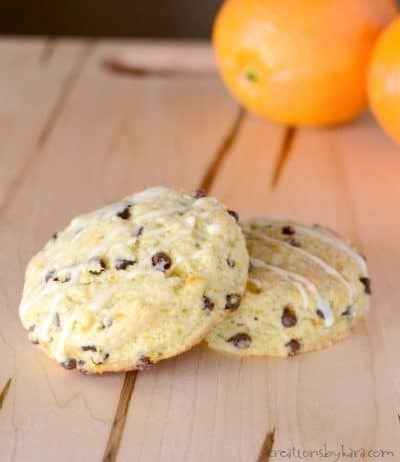 My boys know what scones are but kept calling these cookies “I can’t believe mom made cookies for breakfast”. Lol Thanks 🙂 Fun easy recipe. I love anything PB. I will try with some oatmeal or crunchy pb next time for more texture. I hate baking! Followed the recipe exactly and the mix was super “mushy” (for lack of a better word) there was no way I would be able to cut into triangles. So I put it in the fridge, still didn’t firm up. I just placed the dough on the cookie sheet and baked anyway and it’s one huge cookie. I think regular plain yogurt would work just ask well. I tried making these and the dough was super crumbly. Do you know what I could have done wrong? It could just be that your flour was packed a little tightly. If the dough is crumbly you can always add a bit more milk or sour cream. Sorry, I have never used almond flour so I have no idea. Hopefully one of my other readers will have a recommendation. These were awesome! Everyone loved them! Thanks Jami, I am so glad they were a hit at your house! That’s what we usually do at my house! This was my first attempt with scones. I certainly choose the right recipe for my first try. OMG these are to die for. The only adjustment I made was to add 3 minutes to baking time. They weren’t brown after the 12 minutes. I couldn’t even wait for them to cool all the way. They are sooooo delicious! !